Every year, thousands of Americans are injured or killed while traveling on our nation’s roadways. Many of those accidents involve large commercial vehicles. According to the National Highway Traffic Safety Administration (NHTSA), more than 3,900 people were killed in crashes with large trucks in 2014, and another 111,000 were injured. Georgia is among the states with the largest percentage of large trucks involved in fatal crashes. These accidents accounted for 3.5 percent of all truck crashes across the country, according to the same NHTSA report, with 135 trucks involved in fatal accidents. Only five other states accounted for a higher percentage in 2014. Many different factors contribute to truck accidents, including operator error, such as distracted driving; environmental causes, like icy road conditions; and mechanical conditions, such as tire defects. Tire defects are often overlooked and can lead to serious crashes with deadly consequences. The majority of truck tire failures are preventable. Truck owners and operators are required by law to routinely inspect and properly maintain vehicle tires. Excessively worn tires. Tread depth violations were among the most cited during roadside inspections in 2015. Experts recommend replacing tires when they reach a 4/32-inch tread depth. Violations are issued for a depth of less than 2/32 inch. Improper tire inflation. Over- or under-inflated tires make it more difficult to safely drive a commercial vehicle. Under-inflation also increases the risk of tires overheating. Mismatched tires. In some cases, operators replace only one tire on an axle. Tires of a different size and/or wear affect the stability of a large truck. Different tires also place uneven pressure on the other wheels and mechanical parts, causing trucks to be more prone to rollovers and impacting a driver's safe distance reaction time to avoid an accident. Overloaded tires. Tires are meant to bear certain weight. When a truck is overloaded, too much pressure is put on tires, increasing the chance of under-inflation, overheating, and blowouts. Bias and radial tires on the same axle. Experts do not recommend mixing bias and radial tires, because they have different structures. Therefore, they wear and handle differently. Mounting them together causes uneven wear and instability. Just as it is the duty of owners and operators to ensure the safety of their vehicles, tire manufacturers are also held to specific standards in the production of the tires. When they fail to meet these mandates, they may be held accountable. In some situations, the federal government issues recalls on specific defective tires. To help encourage driver safety, the NHTSA maintains a list of all recalled tires. When manufacturers, owners, or operators do not maintain safe tires, there's a danger to everyone who shares the road. Statistics indicate that when a commercial vehicle is involved in a traffic crash, other drivers and passengers suffer the most. According to the Insurance Institute for Highway Safety, of people killed in large truck crashes in 2014, approximately 68 percent were passengers in the smaller vehicles. Truck occupants accounted for just 16 percent of fatalities. Tire blowout. We’ve all seen long strips of rubber littering the road. A tire blowout occurs when the tire essentially rips apart. This causes the vehicle to pull very strongly to one side and makes it more difficult to handle. The driver may not be able to overcome the pull of large truck and veer into the path of another vehicle. Rollover. The NHTSA states that nearly 2/3 of all truck fatalities occur in rollover crashes. When a large truck rolls over, it's completely out of control. Its height and weight creates a wide path of destruction and can inflict severe injuries, including death. Indirect causes. In some cases, the tire itself does not directly cause an accident. Rather, a driver may be pulled over to the side of the road to address a problem with it. When other drivers slow down to observe them, traffic can become congested and accidents may occur. Additionally, people working on the tire can be struck by oncoming vehicles. In some cases, not only are those individuals harmed, but the initial accident can cause a chain reaction. 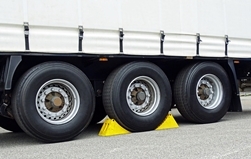 Had the driver or trucking company addressed the tire problem at the proper time off road, the truck may not have had to pull over while in transit. If you or someone you love has suffered injuries in a truck crash due to defective tires, the experienced lawyers at Rechtman & Spevak may be able to help. Call our Atlanta office today at 888-522-7798 to schedule a free, no-obligation consultation to learn about your rights and legal options. Who Can Be Held Liable After a Commercial Truck Accident?